Rinsed, rolled, tied tight, and into the meat locker on 4/12/11. Hung to dry at 55F & 62%RH. Finished product and tasting notes: Smells fantastic, a bit of whitish mold at the top ends where the meat has dried the most… on second thought, it could be crystallized salt. The taste is SALTY, but delicious. It borders on “this is too salty to eat” but then two minutes later you’re picking another bit out of the pan and popping it in your mouth. If I had a bar, I’d fry up little pieces and put it in bowls. Beer sales would triple. Probably should have rinsed, soaked, and rinsed once or twice more before rolling. I only barely rinsed off the brine/cure, and then let it dry overnight in the fridge before rolling. I don’t know why Mr. Long didn’t drop weight even after a whole week more drying. The pancetta is best used as an ingredient — dice it up and throw it in the bottom of the pan before cooking greens, or sauce, or eggs, or almost anything else. 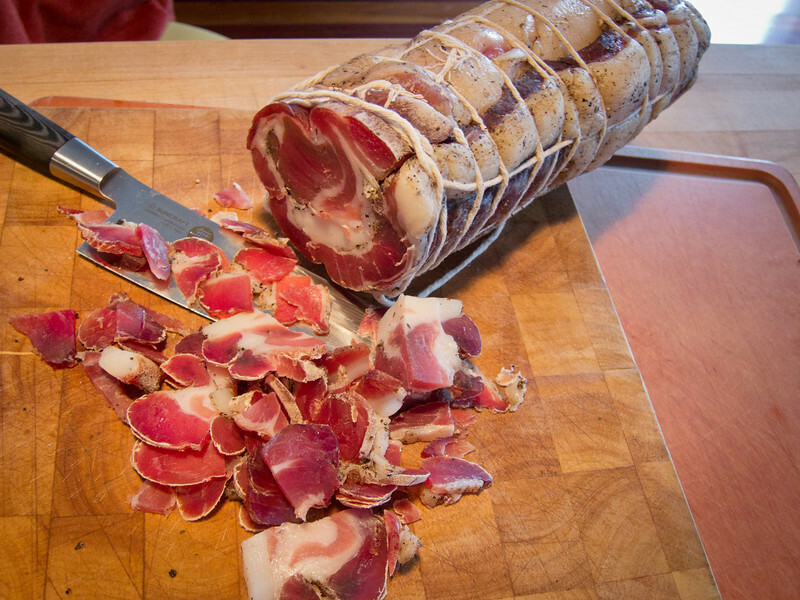 This was leaner than most store-bought pancetta I’ve seen. I probably could have left a bit more fat on the meat. Addendum: In an effort to “desalinate”, I took a few slices and immersed them in some warm water, changing it 3 times over a half hour. The pancetta hydrated and started to look exactly like bacon does, instead of more prociutto-ish. 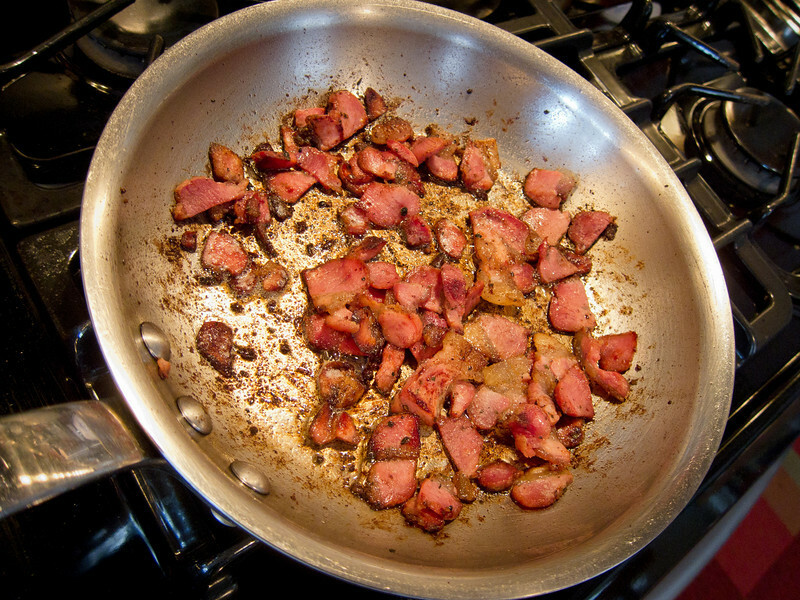 When I fried up the slices, it sizzled and crisped exactly like bacon, and tasted less salty. Delicious.